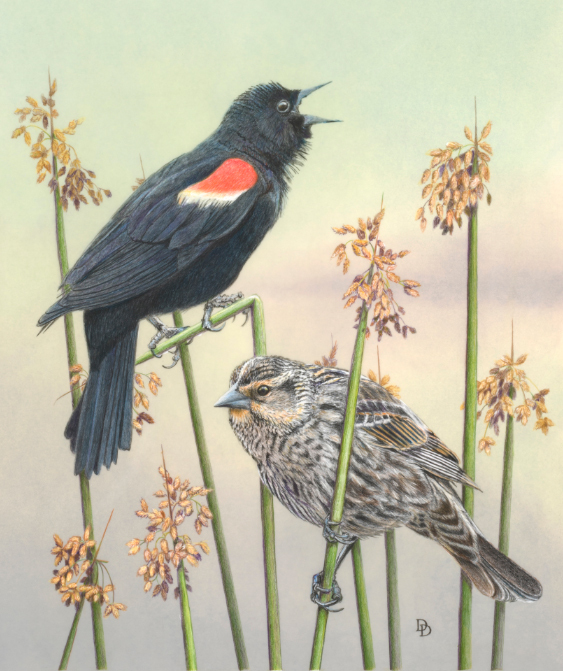 A colored pencil drawing of a male and female Red-winged Blackbird, by Dorothy Depaulo. I was blown away by the beauty and detail in this piece. I love seeing the final result when an artist uses one of my photos! I often get requests from artists to use photos for reference. After an agreement is reached, it’s less often that I actually hear back and see the finished piece. I always love seeing what folks can do with my photos as reference. The creativity and different forms of art out there is really amazing. I was recently contacted by Dorothy DePaulo, who had used one of my photos as a reference source. She sent a scan of a pencil drawing she had done of a pair of Red-winged Blackbirds. It was one of my photos of a female blackbird that she used as reference. All I can say about the finished result…Dorothy certainly justice to the original photo! I was really blown away when I first opened the image. Of course I had to check out the rest of her work on her website, Fine Art by DePaulo. She uses a technique I had never heard of. When she emailed she said she wanted to draw Red-winged Blackbirds, but when I first opened the image, the richness and detail seemed more than is possible with colored pencil! On her website it says she uses colored pencil, but her surface is mylar. By drawing on mylar, she can draw on both sides and get layering not possible with a traditional drawing on fine art paper. Gorgeous drawing! On the one hand, it makes me want to pick up a pencil again and start drawing, since it’s been over a year since I’ve done so. On the other hand…I’m not sure I WANT to pick up a pencil again, as there’s no way I can reach the high bar set by Ms. DePaulo!